The planting zones and language we use to refer to water use of a plant are described below. Images on this page used with permission by Brad Lancaster. 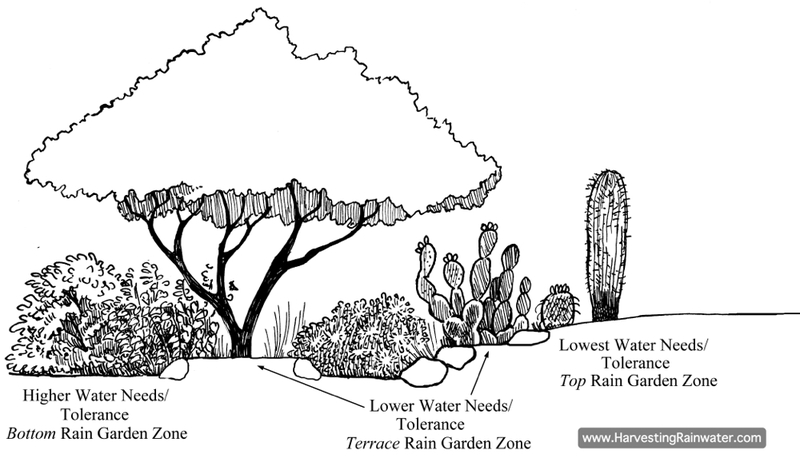 In general we suggest you follow the guidelines for planting as described in Rainwater Harvesting for Drylands and Beyond by Brad Lancaster (we sell these books but you can also get them by clicking the link). These guidelines were created specifically for our region. Most books on the subject of landscaping follow concepts developed in other regions, or using ideology that does not take our specific regional needs in mind. Our arid lands and flora behave differently than wetter climates. Don't just plant native, THINK NATIVE. When you create your landscape, you should grade your land such that the water moves away from the house and toward planting beds. Though these will normally have a gradual slope (unless you employ terracing or gabions), we split them into three zones according to the amount of water they will receive when the rains come. Even if you have plants on drip irrigation (in most cases you probably should) you should design the landscape such that when the rains come, especially summer rains, the water will pool in the areas you want your highest water plants. The lowest zones should be reserved for the species with the highest water needs. The mid zones should be for moderate water plants, and the upper zones for the plants with the lowest needs. 3: Top Zone--plants with lowest water needs. Note that the Rain Garden Zone classification can also be used as a Greywater-Garden Zone when greywater is discharged into a water-harvesting earthwork or rain garden. These zones mimic what is found in nature--the plants that grow in our region are associated with the topography of the region, the lowest zones are normally where the more water-needy plants can be found, while the more drought tolerant in the mid-zones, and the lowest water-users at the highest zones. Also note that plants in the lowest zones are protected from wind and tend to be slightly cooler (especially at night). We suggest you always think about your landscape in this way. The more you mimic nature, the more success you will have with your plants, as they have evolved in this system.